Below are our party packages and lock-in specials. 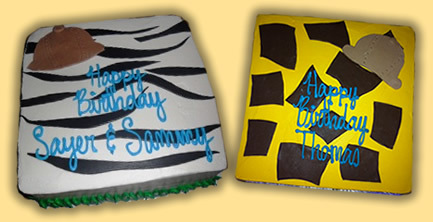 Animal print-themed Cocoa Bean Bakery Cakes can also be ordered for your party. Just ask us for the details! * If you are interested in scheduling a party or lock-in, please call the party planner at 985-340-5858 Monday through Friday between the hours of 12 pm and 8 pm. * Feel free to print and use our invitation template for your party! Parties begin every hour on the hour and last for one hour and 45 minutes. Your party is held in one of our 4 tiki party areas in the facility. We provide animal print-themed party plates, cups and napkins. Feel free to invite as many friends, parents and relatives to the party. YOU ARE ONLY CHARGED FOR THE GAME PLAYERS. If an adult wants to jump in on the fun, they can buy a PARENT PASS for $4.00!! Our EXTREME EXPEDITION provides you with a themed-cake and balloons so all you have to bring is the guests! Of course with our other packages, you are welcome to bring your own cake. Or we can order one for you from Cocoa Bean Bakery. Customize your package by choosing Laser Tag & Coconut Climbing Trees as your Family Fun Attractions. Q: Will anyone else be playing the games with my party? A: We can vest between 24 and 26 guests. If your party is less than that amount, there is a possibility that the public or another birthday may be playing with your party. However, we strive to keep the age level of players very close. It is more fun that way! Q: Can we bring in outside food? A: If you DO NOT have a resesrved party, you CANNOT BRING in outside food (including cakes) into the facility on Fridays, Saturdays and Sundays. We do not have capactiy in the arcade area to accommodate you. You can do so Monday through Thursday, when we are the least busy. If you have a RESERVED PARTY room and your package does not include a cake, you can bring a cake of your choice (and ice cream), but no other food may be brought in. If you want a themed party that is not safari, please keep your decorations to a minimum. We cannot provide any party supplies that are not safari-themed. Isabella's pizzeria next door offers a wide range of food that can be purchased through our "Watering Hole" menu.